Your physical therapy care in our Peoria, AZ office will involve a variety of modalities with a focus on manual treatment. Research shows that manual therapy combined with other methods of care is most effective in alleviating pain. 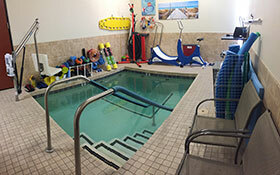 Aquatic therapy promotes joint mobility, blood flow and muscle relaxation. Water offers buoyancy and resistance which creates and environment that decreases stress on joints and healing structures. Our pool ranges from 4-6 feet deep and stays a nice 90-92 degrees. We also have a mechanical lift to offer assistance in and out of the pool. Our therapist will also assist you in the pool if necessary. We believe the many chronic pain patients have suffered for so long because they haven’t found the right equation of care to successfully treat their problems. With a variety of hands on treatments provided in our Peoria, AZ office mixed with flexibility and strengthening programs specifically tailored for each patient, we use every avenue to help you achieve success, reduce your pain, and reclaim your life. Neck pain has become a more common and serious problem as people have transitioned from manual labor, to desk jobs. The day to day stresses on your neck can become a serious issue causing restricted motion, and creating a very painful situation. If this motion continues to be restricted, nerves in your neck can become pinched resulting in symptoms radiating down your arm. As we age, neck pain can also be caused from degenerative changes and a gradual stiffening of joints and ligaments. The skilled therapists at Oakeson Physical Therapy are proficient in mobilization and manipulation of the vertebral joints, as well as the soft tissue surrounding your spine returning your neck to optimum movement and function. It has been estimated that up to 70% of headaches can be caused from strain in the structures of your neck. These structures include several muscles that refer pain not only to the back of the neck and base of the skull, but to the forehead, temples, ears, and jaw. Headaches can also be caused from the stiffness of the joints in your neck, and without formal treatment, may remain tight or become tighter while causing your symptoms to become more severe. Though there are many causes of headaches, physical therapy can often be a successful treatment option for this problem. Dry Needling is a valuable and effective treatment of muscular pain/strains, muscle tension and spasm, myofascial pain and much more. With this treatment, small thin needles are inserted in muscles with painful taught points called “trigger points”. The goal is to create a local twitch response in these trigger points causing them to relax. This in away helps to hit the muscle’s “reset” button, and allow the muscle to release and work normally. This treatment has various applications that can be used for problems throughout the musculoskeletal system. Call and speak with a therapist if you are interested in receiving more information about this treatment option. Up to 85% of people will have low back pain that will cause them to seek some kind of medical attention sometime in their life. This is by far the most common problem seen in an outpatient physical therapy setting. Research has shown that mobilization and manipulation of the spine can have a positive effect in reducing patient’s pain. This effect becomes even more successful when an appropriate exercise and stretching program is implemented with manual therapy. Many of today’s jobs require repetitive movement, stressing the same structures in your body over and over and day after day. These types of activities will eventually cause your muscles to become over stressed and injured. As this stress continues on certain areas of the body, they reach an elevated level of irritation and inflammation. This inflammation becomes chronic because the irritating activity continues without modification, and nothing is done to stop the inflammation from continuing. As the condition progresses, it becomes more stubborn to fix, so getting in for early treatment is important. Undergoing surgery to replace a joint can be scary, but rest assured that you are in good hands at Oakeson Physical Therapy. We are extensively trained in treating patients with total joint replacements, and are very proud of our outcomes with these patients. Almost as proud as the patients themselves! Work place injuries and rehabilitation can be a very complex process. At Oakeson Physical Therapy, we make sure the communication between the physician, physical therapist, and case manager is always clear and quick. Working with workers compensation patients to get them feeling better, and back to work as soon as possible is our primary goal. Whether you are trying to get back to participating in youth leagues, High School, College, or just recreational weekend sports, Oakeson Physical Therapy has you covered. With a long history of treating athletes at various levels, we are in tune with what it takes to get you back to your optimum sport performance at your pre-injury level of play. Following illness, injury, or just a gradual weakening of the body during the aging process, physical therapy can help restore your body's normal function and strength so you can live life again without feeling worn-out, weak, and unstable. Using equipment to help unload your spine, and create a distraction stretch between your vertebrae allows pressure on a pinched nerve to be relieved. We can use this in conjunction with stretching, exercises and hands on treatment your therapist feels will benefit you. Though this procedure is not indicated for everyone, it is often a helpful asset in spine care. Special training, and knowing and enjoying the game of golf helps our therapists treat pain and injury related to your golf swing effectively and efficiently. Let your Doctor know you would like to come to Oakeson Physical Therapy to get your swing working painfree! Manual Therapy is an all encompassing term that relates to treatments that are performed through the skilled hands of a physical therapist. This can include joint mobilizations or manipulation of the spine or extremities, soft tissue mobilization and massage, stretching, or various other forms of hands on treatment. Research continues to show patients benefit, and even respond to treatment better when manual therapy techniques are integrated into therapy. We are conveniently located in Peoria, AZ.